Deputy President William Ruto is expected to lead mourners at today's burial of former world hurdles champion Nicholas Bett at the athlete's Simat home in Uasin Gishu County. A top source in the DP's office said Mr Ruto will lead other government officials at the burial. "I can confirm that the DP will be attending Bett's burial. He will also deliver a message from President Uhuru Kenyatta to his family, friends and relatives," said official. A sombre mood engulfed Eldoret as the hearse carrying the athlete's body snaked its way through the town. The hearse, led by a police outrider passed through Uganda Road before branching onto Oginga Odinga and Nandi streets all the way to the Rivatex-Ndalat road where those who walked from the Eldoret Hospital's mortuary boarded vehicles and headed to Bett's home some 15 kilometres away. The Kenyan track and field team that represented the country in Asaba, Nigeria -- led by javelin champion Julius Yego -- donned the official team uniform and led the way holding the Kenyan flag. Other athletes and friends wore black T-shirts with Bett's photo printed on the front. 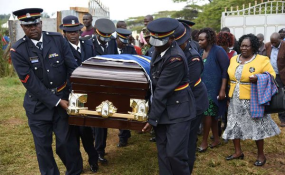 Family members, relatives and Bett's colleagues from the National Police Service, led by the service's Directorate of Logistics, Joseph Kiget, were in the convoy. Uasin Gishu Governor Jackson Mandago described Bett as one of the world's best athletes who will be remembered for his good performances that culminated in a gold medal in the 400 metres hurdles at the 2015 World Athletics Championships in Beijing, Kenya's first in this track event. He further said his county had undertaken to assist in the funeral arrangements, including constructing a road to the athlete's home. Over the last week, the county government's road construction machinery equipment has been dispatched to renovate the road leading to Bett's home ahead of today's burial. "Let me officially convene my heartfelt condolence to the family and friends at this trying times," said Mr Mishra.